Many new fitness products are released into the marketplace every year. A couple months ago I received an innovative new fitness device as a gift. I love this little gadget and I’m amazed at the innovative features offered by this fitness tracker. Since I’m always watching for innovative products and services, I was excited to try out this new fitness tracker. 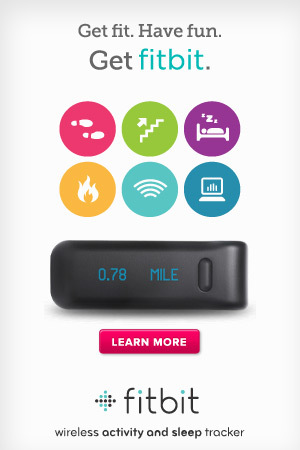 The device, called a fitbit, is a 21st century pedometer (see picture on the left – click the picture to visit the company’s web site). The old-fashioned pedometers measured the number of steps a person walked each day. I had one of those old devices many years ago – I used it for a while, but the novelty wore off quickly. I often had to adjust the device to be sure it was properly registering my steps. Counting my steps each day was useful, but the device had no other features. Also, I had to record my steps each day and then reset the pedometer each morning. But, my new fitbit is a completely different story. Yes, it counts my steps – but that’s just the beginning. This device counts the number of stairs climbed each day, the number of calories burned, sleep patterns, and more. The fitbit wirelessly communicates with my laptop, which automatically stores my daily steps, stairs climbed, and other data. Also, an app for my smartphone displays this data and lets me enter other information, such as the glasses of water I drink, the food I eat, and more. I recharge the device about once a week by connecting it to a docking device that connects to my computer. The small size allows me to easily carry the fitbit in my pocket or clip it on a shirt sleeve or belt. I find myself looking at the device many times each day and it helps motivate me to go for a quick walk or climb an extra flight of stairs to meet my daily goals. And, you can “compete” with your friends that also have a fitbit to see who climbs the most stairs in a day, etc. This social aspect of fitness provides new motivation to be active every day – and lets me participate with friends all over the world. I love innovative products like this – taking an existing product (pedometer) and putting a new “twist” on the design that completely changes the functionality and usefulness of the product. Think about the products/services in your own business. Can you “update” those products/services to create a whole new user experience? And, if you have a fitbit, let me know so we can have a friendly fitness competition.